University of Tokyo and UC Berkeley first shared a stage in 2003, when UTWE visited San Francisco as part of their U.S. tour. Both UTWE and the UC Berkeley Wind Ensemble performed at Herbst Theater. 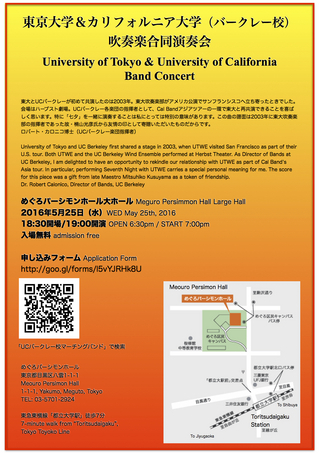 As Director of Bands at UC Berkeley, I am delighted to have an opportunity to rekindle our relationship with UTWE as part of Cal Band's Asia tour. In particular, performing Seventh Night with UTWE carries a special personal meaning for me. The score for this piece was a gift from late Maestro Mitsuhiko Kusuyama as a token of friendship.